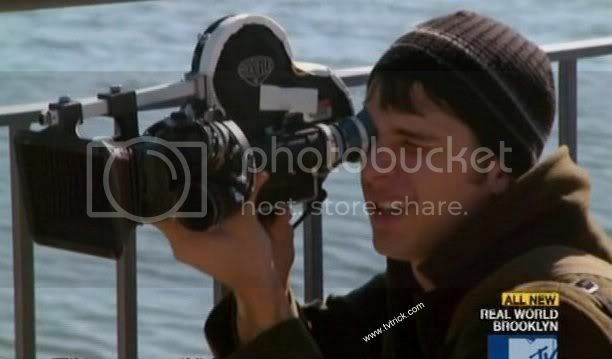 In episode eight of The Real World Brooklyn, Ryan Conklin began to express his inner Spielberg. He has an affinity for filmmaking and since he was in New York and had time on his hand, he decided to get some training on it. 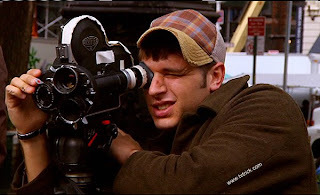 He had dabbled in filmmaking during high school and was ready now to get into more advanced instruction. Ryan started off with getting his feet wet and back into it by participating in the taping of a promotional webisode for the Fairway Market grocery store in New York. He and Chet had been invited by Daniel Glickberg of the family that owns Fairway Market to watch the taping of a webisode on how to carve a turkey. Ryan watched the process with interest and actually got the opportunity to do some impromptu interviewing in front of the camera. He did a good job with it as he always look legit, no matter on what subject he's talking. Unfortunately, during the interview Ryan and Chet became possessed by the MTV spirits of Beavis and Butthead. They started giggling when there was a mention that when carving the bird you should slip the tip in and feel the bone. Unable to go on, Ryan's brief foray into instructional videos for food preparation was brought to a close. Hoping for something better, Ryan enrolled in a 4 week program at the New York Film Academy. Once he started there he was very excited about gaining understanding about the art of film making and about evoking his creative tendencies. Early in the program he was shown a scene from Apocalypse Now with the sound muted and he said he was blown away by seeing how the emotion was still conveyed by the visuals. During the program Ryan would have 3 projects to do. For his first project, which was on 16mm, he has to do a mise-en-scène lasting under a minute using only three shots. He had Chet Cannon and Scott Herman be the actors. Chet played a man sitting on a bench reading a newspaper with an apple, which gets stolen by Scott. In Chet fashion, he was proud and boasted of his performance in his "demanding" role. For one of his next projects, Ryan decided to do a very "dark" film. He chose himself to be the actor because he knew what he wanted from the role. He remarked that acting was easy for him. It should be, with Ryan's expressive face and better-than-James-Dean look. Ryan's favorite part of the process was the editing. He loved being in the editing room by himself focusing on crafting the materialization of his vision. He put a lot of hours into it but enjoyed the hard work. One night when Chet came home very late he noticed that Ryan wasn't there. Chet became very worried and tried to call Ryan but got no answer. Eventually Ryan called back and said that he had fallen asleep on the train and now he was out on the street somewhere. Chet, Scott, and JD Ordonez immediately went to go pick him up. They found Ryan and told him how much they had been concerned about his whereabouts and how much they cared about him. It would be good if Ryan Conklin used that as inspiration to turn away from dark subjects and make a good buddy movie, reflecting the camaraderie and goodwill that Ryan engenders in his friends and all those around him.